Pure Markt in Park Frankendael is one the most fun markets in Amsterdam. Every last Sunday of the month it brings together a wide variety of local artisanal food producers to sell their produce amongst much sampling and expert talk. Unfortunately, the Pure Markt goes into hibernation in November and you’ll have to wait until March 2010 for the next edition. Here are a few pictures from the last edition in October to keep you interested until next year. The Glühbier caught my eye because it was so random, but I refrained from it since lots of Glühwein will be coming my way in December. 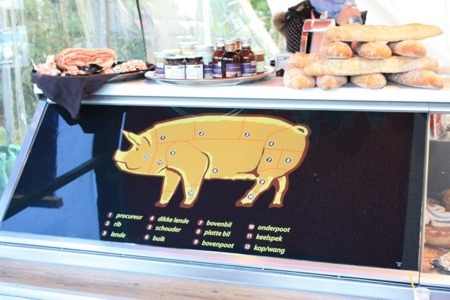 The pork cut chart is by the Berkshire Butcher who makes amazing sausages. 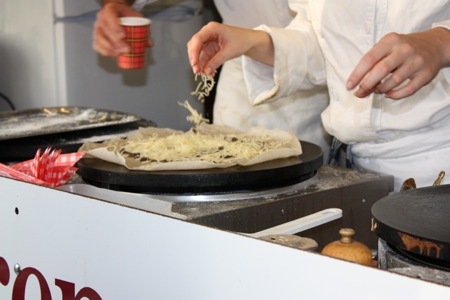 And I had tried and liked the crêpes and galettes from a real French chef and his Crêpes-Mobiel before and had to go for a galette with truffles, walnuts and gruyère.